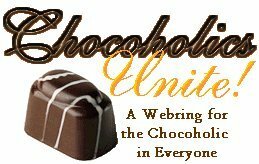 There are many pages on the web with delicious and exotic chocolate recipes, encyclopedic background and history of chocolate and all its forms, philosophic speculation on the essence of chocolate and why it is such an essential in our lives. I have links to them. I am not going to try to imitate them. In a tall glass, stir chocolate syrup into about an inch of milk. Throw in a few ice cubes. Enjoy an inexpensive chocolate ice-cream float. Lay Hersheys Special Dark across a peanut-butter cookie. Eat as soon as it won't scald the roof of your mouth. Some of them are sensible. "Chocolate And Coffee Are Not Merely Edibles, They're A Lifestyle."